The busy and lively border town of Samdrup Jongkhar is the oldest town in the country. The town is a confluence of mixed cultures and while walking on the streets you can identify at least 6 to 7 different dialects. Samdrup has a strong Asamese influence and hawkers, vendors etc all who crossed over from the Indian Border town i.e. Darranga. Mostly, the Sharchops and Lhotshampas dwell here. Though not as popular a tourist transit point as Phuntsheoling, Samdrup Jonghkar is a good tourist destination (people call it “little sister of Phuntsheoling”). In fact, if you are interested in seeing central and eastern Bhutan like Trongsa, Trashigang, Bumthang, Mongar, Bartsam, Lheuntse, Deothang etc. then entering Bhutan via Samdrup is a better option than entering through Phuntsheoling or Paro. Samdrup Jongkhar is the biggest commercial and urban centre in Eastern Bhutan and it’s here that locals living in nearby Dzonkhangs come for shopping. Guwahati Airport is 110 km away from Samdrup and one can reach the town in 3 hours via cab. Druk Air operates many flights per week from Paro to Guwahati. However, it is important that the permits are obtained beforehand through a travel operator as the permits process at Samdrup does not function consistently. In fact, few years back entry/ exit from Samdrup was banned because of election issues. Right now, entry/ exit has been resumed but checking with your tour operator beforehand will be a good idea. From Trashigang, dally buses go to Samdrup Jonghkar. The bus leaves at 7.30 a.m. and reaches at 5 p.m. so basically you will spend the whole time in travelling. From Mongar, daily buses (apart from Monday) run to Samdrup. The bus leaves at 6.30 a.m. and reaches at 4.30 p.m. From Pemagatshel, a bus runs every Thursday to Samdrup. The bus starts at 10 a.m. and reaches at 3.00 p.m.
From Gelephu to Samdrup, the distance is 218 km and the full taxi fare is 3988 NU. From Phuntsheoling to Samdrup the distance is 338 km and the full taxi fare is 5092 NU. From paro to Samdrup, the distance is 498 km and the full cab fare is 8056 NU. From Thimphu to Samdrup the distance is 502 km while the cab fare 8900 NU. If Bhutanese architecture interests you then you will like seeing the newest Dzong of Bhutan i.e. the Samdrup Jongkhar Dzong. Unlike all other dzongs this one is made from cement and does not even stand at a strategic point/ cliff or a vantage point. The Dzong is built on a plain vast piece of land and has clean modern lines that are a stark contrast to the mystical effect of the older dzongs. The Samdrup Dzong is inside the town and serves as the administrative and judicial center of the town. If you have seen the Zangtopelri Lhakhang in Phuntsheoling then you will immediately notice the striking similarities between the two Zangtopelri Lhakhang’s in Samdrup Jonghkar town and Phuntsheoling. The Antiopera here represents the heaven envisioned by the Buddhists and has many beautiful murals, paintings and wall carvings. The border gate at Samdrup Jongkhar will remind you of Phuntsheoling... it looks the same. The contrast between the Bhutanese and Indian side of the border is also a reminder of the chaos that exists on the Jaigaon side of the Indo-Bhutan gate. However, if you are a shopaholic then do walk around the local Mella Bazaar in Galakha side... fashionable apparel and foot wear along with local crafts and souvenirs are sold at quite affordable rates there. The street food there is very tasty... you will get all kinds of Asameese and North Indian food here. Another small hamlet in the Samdrup District, the Bhangtar is known to be a good picnic destination as well as a birding spot. Many Bhutanese people of Nepali origin stay here and you might get to sample some mouth-watering Nepali dishes while you are here. This is a very good spot for swimming too and you will thoroughly enjoy the experience if you wish to spend some hours here. Note: The Bhangtar trip is not recommended in the monsoons as the area gets incredibly muddy and slippery. On the highway leading to Samdrup Jongkhar in Orong (right above Dewathang a small hamlet) is one of the major attractions of Eastern Bhutan. Orong is visited by many tourists who flock in to see the Mithun Breeding Farm. The splendid Mithun or Bison is bred here and this is supposedly the best breeding farm in East Bhutan. The Mithuns here are splendid robust animals and the experience is sure to be great for photographers and naturalists. Incidentally, the eastern Part of Bhutan is the remotest area in the country and thus has the richest forest and ecological reserves. If you are a nature lover/ animal lover/ birder or a trekker then visiting one of the many national parks and exploring trekking opportunities that Samdrup offers will be a good idea. Here are all the principal national parks and sanctuaries in Eastern Bhutan along with plethora of flora, fauna and indigenous cultural experiences. Remember that these are protected areas and you need to arrange your trip in collaboration with a registered tour operator in Bhutan (preferably in Thimphu as that’s where all special permits are issued). You will also have to strictly follow all rules and regulations issued to you as the Bhutan Govt is very protective about its ecological resources. The Satkteng Wildlife sanctuary is situated in the Eastern Part of Bhutan and it has 650 sq. km area. The main goal of the park is to protect the Yeti which is an endangered species. The park shares borders with Tawang in Arunachal Pradesh and phongmey Geog in east while western border is with Kangpara geog. The Sakteng National Park is also known as the migoi National Park and it is believed to be the best Migoi or Yeti spotting region (huge Bipeds that resemble Yaks but are bigger). Trekking through the Sakteng park will allow you to experience the least explored and unspoiled bounty of nature which is populated by red pandas, snow leopards, barking deer’s, Himalayan black bear, red fox, Asameese macau, blood pheasant, dark breasted rose finch, hairy bellied Himalayan squirrel etc. There is a 6-day trek that covers Merak and Sakteng park and provides trekkers the unique opportunity to explore the part nomadic life of yak herders who have a unique culture and completely different way of life. This is a moderate difficulty trek starting at Chaling (ranging between 1500 m to 4100 m) through the villages of Gengu, Sakteng, Merak, Joenghkar etc. and ends at Phongmey (other route options are also available). The campsites are beautifully designed and seem to blend in with the background with stone walls and wooden architecture. Sheds, toilets, kitchen, washrooms and dining area is available. Literature about flora and fauna and trekking rules are also provided. The Bumdeling Wildlife Sanctuary is in the North-Eastern part of Bhutan in the foothills of the eastern Bhutan. The borders of the 144-sq. km wildlife sanctuary are shared by Lhuentse, Samdrup Jonghkar and Mongar Dzonkhangs. International border neighbours are Arunachal Pradesh (India) and Tibetan Province (China). The Bomdeling Wildlife sanctuary is a famous birding area and the goal of its creation was to protect the famous black necked cranes (150 cranes spend their winters in the park). Apart from the cranes, close to 290 other species of birds dwell here including Pallas Fish Eagle, Yellow Rump Honey Guide, blood pheasant, snow pigeon and rare Gloud Shortwing. There are many exotic mammals in the park like Capped Langur, Snow Leopard, Red Panda, Serow, Goral, blue sheep, 3 striped squirrel, wild pig, assamese macaque etc. The Sharchopgas, Bhutanese people of Tibetan strain and Zalakha speaking tribes live in the Wildlife Sanctuary. There is a rich reserve of ethnobotanical species (more than 166) in the park that are used for making woodcraft, tea, vegetable dye crafts, fibres etc. other places of interest in the Sanctuary area are Rigsum Gompa and Dechenphodrang Lhakhang. A popular Bumdeling trekking route originates from Trashi Yangtse on the east of Kulong Chu river and then to Solomang and then to Dechenphodrang Gompa before reaching to Jingbu Gompa and then to Kulong Chu river. There are camping arrangements and a tourist lodge inside the park. The Khaling/ Jomotsongkha Wildlife sanctuary holds the reputation of being Bhutan’s smallest protected wildlife area of only 273.8 sq. km) and its situated on the southern border with Assam. Khaling has elephants, pigmy hog (rare species) and gaur along with hispid hare. In Assam, this area is known as Khaling national park. The forests are sub-tropical, semi evergreen and broad leaf and there are rare birds like chestnut breasted partridge and rufous necked hornbill found here (the area has been marked as an important birding spot by Birdlife International). The Royal Manas National Park holds the distinction of being the oldest protected area in Bhutan and it spans more than 1023 sq. km. Established in 1966, the park was upgraded to the status of national park in 1993. A rich collection of wildlife exists in the park like rhinoceros, wild buffalo, elephants, leopards, bears, tigers (50 of them exist in the last count) and many strains of bear. You can also spot the golden capped langur, rare pygmy hog and hispid hare along with barking dogs and wild boars. More than 360 species of birds exist in the Manas national park. The Manas National Park was closed to visitors in the past and till now very few people visit (though the park is now open). Get the paperwork and permits for visiting the park done via a good agent in Thimphu (impossible to get this done on your own). The park joins the Manas National Park in Assam forming a cross border conservation area. The RMNP administrative body along with WWF Bhutan first launched community oriented ecotourism projects in 2010 to promote tourism based income, uplift local communities (1026 households exist inside park), reduce illegal activities and increase the exposure of Bhutan’ rich flora and fauna reserves. The Gomphu Pangtang Eco Trail is the oldest and most established eco trail inside Manas Park. The eco trail starts from Zemghang and then explores the foothills that exist on the plains of Indian Manas Park. You can choose to stay at any of the 5 eco camps at Gomphu, Pangbang, Pangtang, Shillingtoe and Norbujang (all are managed by the Nature Recreation and Ecotourism Division, Ministry of Tourism and Forestry, Bhutan). The Gomphu camp has two eco lodges with dining, bathing, living and kitchen facilities that are located right next to Gomphu Park Range office. The trail from Gomphu to Pantang will require hiking through broadleaf and luscious undergrowth’s but you will be rewarded by spotting of thrushes, bulbuls, partridges, hornbills, eagles, barbets, eagles etc. you can also observe forest life at the Pnagtang settlement. In the Shillingtoe settlement you can see a bird’s eye view of a great portion of the park. At the Pangbang settlement (last halt), you can participate in elephant rides, boating, river rafting at the junction of Mangme and Dagme rivers. The Singye Dzong is one of the more spiritually significant dzongs of Bhutan. Many devout Buddhists take pride in walking three days from the Dzong in Lhuntse to Singye Dzong. The Singye Dzong is known as the mysterious Lion fortress and it was established by Khandro Tshogyal and its shaped like a mountain which looks like a dozing lion. There are literally no signs of human habitation around the Singye Dzong which is why it’s considered to be a good spot for meditation and spiritual retreats. Legends say that the Singye Dzong is built at the exact spot where Guru Rinpoche had resided after destroying a whole demonic kingdom in Khempajog. In the 19th century, priceless religious scriptures were discovered by Zilnon Namkha Dorji. Interestingly this Dzong is the only one that’s internally divided into 8 divisions; Rinchen Dzong, Gawa Dzong, Draki Dzong, Namkha Dzong, Singye Dzong and Dulwa Dzong. These are engraved in rocks and represent 8 manifestations if Guru Rinpoche that are uncovering the secrets of mind and body. Other notable attractions near the Singye Dzong are Tshokhar (white Lake) and Tshonag (Black Lake). Look out for strange mystical features of the Dzong like rock containing 108 evil Garudas who threatened to pollute the world and the hand print of Khandro Tshogyal. This is a tiny hill station town is about 18kms away from Samdrup Jongkhar... You can hike from Samdrup to Dewathang if you want. This 18 km stretch covers a forest which offers excellent birding opportunities. For history lovers, Dewathang will hold an unique appeal as this is the site where the 1884 battle against British troops was fought under the leadership of Gongar Wangchuk (Father of the first king of Bhutan). The Sinchula treaty with the British (which had strong political ramifications afterword) was signed after there. From Dewathang you can climb up the small hillock to the Mithun Breeding Farm in Orong. You can also check out Gyadrung’s office at Dewathang. Other attractions in Dewathang are the secret holy place Tsasum Chharbebling and the institution of Throma practitioner called Dudjon Dharma House. You can also see the Chokyi Gyatso Institute and the SJI initiative institute. The more adventurous at heart can embark on the 8- day long salt trek which was used to transport salt and silk from India. There are no ultra-luxurious hotels in Samdrup Jonghkar but you will get some comfortable accommodation options. There are some experiential lodges in the National Parks and various scenic points in the Samdrup district and you can check those out if you want to stay in close affinity to nature. As in everywhere else in Bhutan, carry plenty of cash. As mentioned earlier, Dewathang is a scenic little hill station 18kms away from Samdrup Jonghkar town. This is one of the classier accommodation options in the Samdrup district. The staff are quite polite and friendly and the hotel is well decorated and comfortable. There is a choice between single, double and family rooms. The hotel has facilities like organic farm, 50 seater dining hall, well stocked bar and private meditation center. The tariff per night is 3000 NU but the management is conducive to discounts especially if you come in groups. Keep checking their Facebook page. they publish offers there. Food is traditional Bhutanese but the quality of dishes is really good so you won’t really mind. Limited continental and Indian dishes are available. Hotel has very good conferencing facilities so it might be considered for official retreats and seminars. Wi Fi connectivity is great and housekeeping standards are also good. Every first Saturday in each month, there is a grand brunch in the Hotel with a tempting array of food and drinks. Even if you do not stay in this hotel, trying the Saturday brunch could be great. 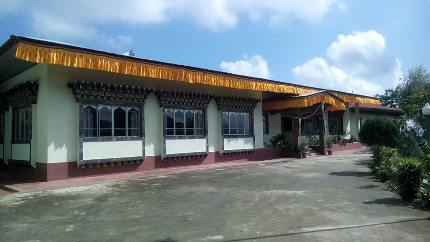 The Tashi Longched Trokhang or TLT Hotel is one of the best accommodation options in Samdrup town. The bus stand, taxi stand and the immigration office are all very near. The property looks decent and the food is also good. Breakfast was superlative with muesli, scrambled eggs and brown bread. Hot water is provided though the geyser takes a long time to warm the water up. There is a balcony from where you can view the entire market area. Stay only if you can get the AC rooms though (the tariff per night is 1500 NU), the non-AC rooms are not that good. If you really want to stay close to the border then the Mountain Hotel is your best option in Samdrup Jonghkar. Tourists use Samdrup Jonghkar either as a transit or an entry/ exit point so the Hotel Mountain caters to those classes. The positives are that the hotel is clean, rooms are big, service is friendly and prompt and Wi Fi is good. On the downside, there is no lift (avoid taking rooms on upper floors) and the plumbing in the washrooms is not good. Also, the mattresses are not comfortable enough. However, if you look at the tariff which is just 1000 NU per night then the inadequacies seem to lose their importance. Food is okay though nothing great. Though the Tashi Gasel doesn’t look too impressive from the outside, its nice, clean and comfortable once you finally look inside. This is more of a lodge like accommodation than a proper hotel so do lower your expectations accordingly. The tariff is only 1500 nu plus 20% service tax per room per night. Only 9 rooms are available in the lodge and in the peak season, the lodge gets booked pretty fast. The rooms are air-conditioned and most have attached balconies. Cable TV, Attached Bath, Water Bottle and hot water are provided. This is a basic type transit type hotel that has only 12 rooms. The air-conditioned room tariff is 800 NU plus 20% tax. The rooms are smallish, homely and clean and there is wrought iron furniture inside. There is an in-house restaurant and bar which serve okay quality of food. The service is also passable. The Bansbari Lodge is a good option for you if you are keen on spending a couple of days inside Manas National Park and do not really want to Camp. The lodge will offer you comfortable and almost hotel like ambience and will also arrange tiger safaris for you. Food is Indian and some basic Chinese items. You will get western style washrooms and all modern amenities. Tribal Indian dances like the Bihu dance are performed by tribes (about 50 families reside inside the park) on request. There is a beautiful tea garden in front of the lodge. Samdrup Jonghkar doesn’t have too many fancy dining places... but there are small eateries in the town where you can sample Assamese and Bhutanese snacks. Besides tasting Bhutanese food in Samdrup, you should cross the border and visit Darranga to taste dishes like Bor (fried balls of mashed spicy lentil) with tamarind Dip and Pokori (fritters made of pumpkin, eggplant, gourd etc.). You can try out these restaurants if you are not so happy with your hotel food. If you do go to Mella Bazaar for shopping then this is the place to quickly stop for a bite when you are famished. This restaurant is just 5 minutes away from the border gate and it’s on the Indian side. However, you can use Bhutanese currency here... the owner will happily accept it. The noodles, chilly chicken and momos here are the most popular options so maybe you could stick to having those. This fully Indian restaurant is a little further away from the bazaar in Darranga but it’s a good option if you are craving a wholesome Indian meal with rice, lentil soup, vegetable curries, chicken/ fish and sweet dishes. The thali at Vatika is quite good and reasonably priced at 200 NU/INR. South Indian food is also available. The restaurant also serves sweets and ice cream. A quaint and attractive looking little shop in Deothang, this is your Go To place for Pizza and coffee if you are bored of the usual Bhutanese food on offer. Do not expect Italian style pizza though, the pizzas have a strong local touch but that doesn’t make them unappealing. You will get fresh hot coffee, sandwiches and pastries too. Open from 6 p.m. to 12.30 a.m.
A great hangout place for the youth in Samdrup Jonghkar... this is one of the few paces which indicates the presence of nightlife in Eastern Bhutan. The music is great and the alcoholic beverage collection is impressive. You will get a good selection of snacks too. Try going in the weekends... the crowd is livelier. Note: it’s better to visit the pub with a group as lots of cross border people come and they tend to be a little rowdy.